Today, Sarah and I took a day off. We have been working full time; Sunday to Friday we are occupied with different tasks. Sabbath is such a break! but even so we are responsible for helping out in church services, etc. Looking back, we’ve been running non-stop for about 3 weeks (not counting while we were sick, which we weren’t working but it wasn’t “rest” by any means!). This past week, I was helping with maintenance on our airplane, trying to diagnose a problem. We finally discovered we have a faulty exhaust valve due to warping from the heat. The only thing we can realistically do to fix it is to order parts from the US and pay an arm and two legs to ship it over. Between finding the problem, researching solutions and ordering parts with our tediously slow Internet, and performing a maintenance inspection of a National Parks plane, we were solidly booked. In addition, I unintentionally caused a bit of a stir during church the week before, so I was left trying to figure out what exactly was being said. At the same time, Sarah was busy. Hot season is almost upon us, so she took time to move our bedroom, which is inside the brick oven…ahem, inside the house, to our porch area, where the air flow keeps life much more manageable. We also ran out of several food items I had bought in N’Djamena, so she has had to learn quickly to make meals exclusively with locally available ingredients, which is very difficult. 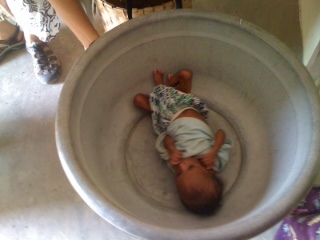 In addition, Wendy has been sick, so she jumped right in and managed 3 malnourished babies with her French still in the early learning process. She essentially was in a sink or swim situation, and I think she did just swimmingly! 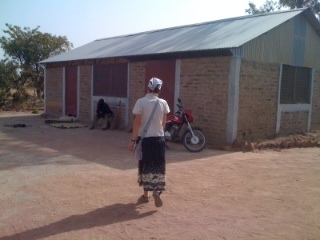 This building has a large kitchen on one side and volunteer housing on the other side. 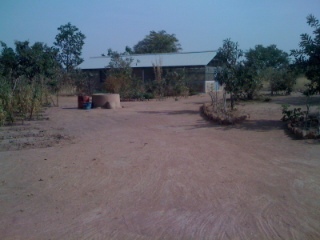 This is half the office building and the other side is volunteer housing. 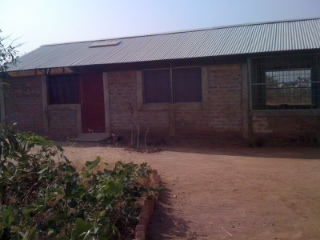 This is the “dorm” building where the mothers and babies stay when the center is up and running. So finally, today, we took a break. No work, it was a family day, essentially. I woke up early (comparatively) and read a couple chapters of the Great Controversy. Breakfast was made the night before, so we ate, then lazily did dishes as we listened to Pathways of the Pioneers. This evening we received word that a cat down at the hospital had given birth this morning, so we went to see the little rat-like creatures, then spent time hanging out with the two Project 21 leaders. Tonight, my parents called on a Skype account, and we got to hear their voices again, which was very nice! It was a very refreshing day all around! Thank you for all your prayers and encouragement! God has brought us up. We’re not on top of the mountain, but we are no longer deep in the valley either.